In 2017, I set myself a goal to get accepted to speak at 4 technical conferences. I’m a big goals person — every month I reassess my list of personal goals, record my progress, and make adjustments as necessary — so when I set out to do something, I usually figure out a way to make it happen. I had done enough presenting, teaching, singing and acting in my life to feel pretty comfortable on a stage, but I had never tried to break into the tech conference scene. Like many software developers, I felt that I didn’t really have that much to talk about, that my experience was not unique, and that someone in the audience would call me out for being a fraud. Grappling with the fear of inadequacy is a lifelong pursuit for many of us. I’m fortunate to not be crippled by it, but it still took me years to put myself out there and give a technical talk. The way I overcame this fear was to start small. As I came up with talk ideas I pitched them to local meetups and code bootcamps. After giving some of these talks, I realized that the audience isn’t as scary as I thought. These are just other developers who genuinely want to learn something, and I’m lucky enough to be helping them! Four conferences was arbitrary. It felt like enough that I would be able to call myself a “real” conference speaker, but not so many that I would have to travel all the time. I love traveling, but with a wife and puppy at home, I have practical limits. So, I settled on four, and started forming a plan for making it happen. As I worked my way through the checklist (it probably took about 12 weeks in all), I learned a lot about how to write a good proposal and what conferences usually looked for. I was very careful to read the conference’s CFP page, but I’ll admit that I sometimes submitted proposals that weren’t an ideal fit anyway. Within a few weeks, I had gotten my first acceptance! Now I knew what it would take to get a talk accepted, and I felt like I had some momentum. With one conference booked, I started refining and practicing my proposed talk. The very first time I went through the slides it took me 25 minutes…for a 45 minute speaking slot…whoops! But while I was preparing, I was surprised to see acceptances continue rolling in. I ended up getting 7 accepts in the first few months of pitching my talk. I was excited, but started to run into some tough decisions. One conference in Romania was the same weekend as a family obligation and two conferences were on the exact same day, so I turned down the second one that accepted me. In another unexpected turn, one conference couldn’t get the attendance they needed, so it was cancelled outright. 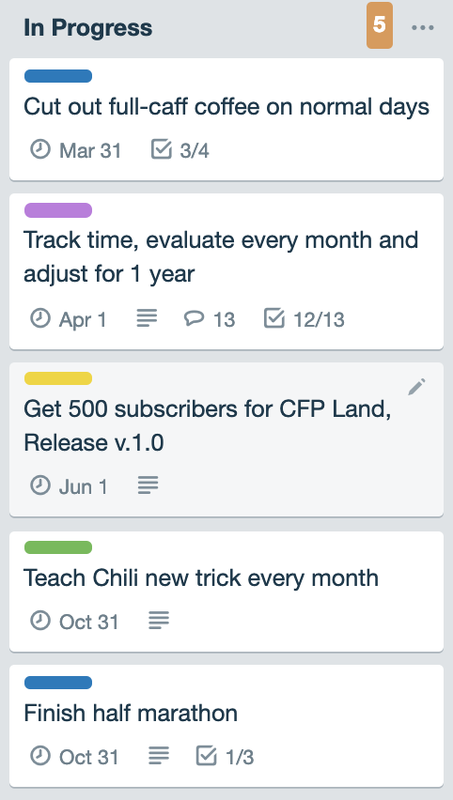 I learned a lot in that first year speaking, and while I’ve dialed back the number of applications I submit, I’m still actively engaged in the speaking community, and submitting a few CFPs per month. The whole experience has showed me that speaking isn’t as scary as it seems, and submitting winning CFPs isn’t a black art. 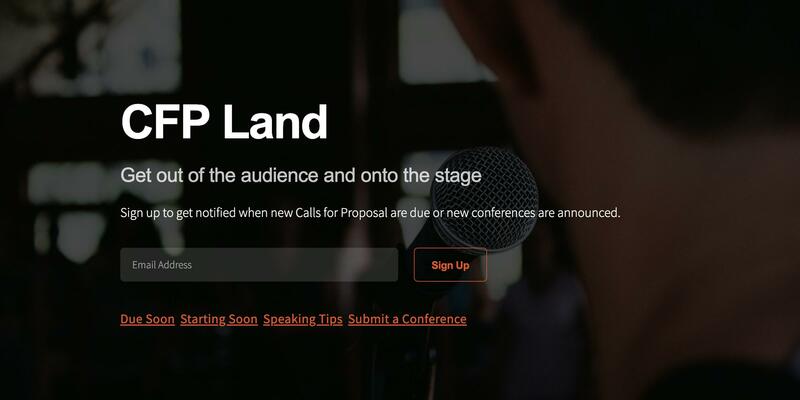 It inspired me to create something that would help other speakers — new and experienced — improve their odds of success and become better, more prolific speakers, and thus CFP Land was born. One of the most frustrating things for me was when I’d discover a great conference in a fantastic location just a few days or weeks too late. Once the CFP closes, you have to wait a whole year to get back in the mix, and keeping up with dozens of conferences is a lot of work. Initially, I used Airtable to store all the conferences I could find. Each week, I’d manually check on them and update CFP dates and links as needed. It took valuable time away from the real work of writing proposals and practicing my talk, so I thought this problem needed a better solution. Fortunately, other conference aggregators and CFP websites already exist, but the killer feature that they were missing was a single weekly reminder of all upcoming CFPs. This seems obvious, but I wouldn’t have thought of it if I hadn’t spent months applying for CFPs. As a speaker, I don’t want a huge list of conferences or a bunch of noise — I just want a focused, weekly reminder of all the CFPs that would be right for me. In its current iteration, CFP Land is an email newsletter with all the upcoming CFPs listed in chronological order. I also Tweet each CFP when it’s due in 30 days so followers have plenty of time to submit. As speakers have joined, I’ve gotten some great feedback, and am working on improvements already. In the coming months, you’ll be able to filter CFPs by location, category, and whether or not travel/hotel costs are covered. I’m also working to get more data from more sources so speakers are really sure to never miss a CFP again. Of course, I can’t continue improving CFP Land without input from other speakers! If you’re a technology conference speaker and you’ve got feedback, email me at [email protected] or sign up below to start getting the weekly newsletter 💌.